Cerise has been on my list to review for quite some time – mainly by reputation. And yet, in the run-up to visiting the strangest thing happened: I couldn’t find anyone who had eaten there. Everyone knew about it, of course, and some people had even had cocktails in the opulent basement bar, or a sneaky summertime glass of white in their secret garden. But the restaurant? A total blank. So I did some Googling, only to find the same thing: no reviews, not in blogs, not in guides, not in the papers. Apart from TripAdvisor, there was no evidence that anybody had been at all. I guess it’s always been awkward for them: the restaurant of the Forbury Hotel, right opposite a restaurant called Forbury’s, with the unfortunate consequence that people always think you’re talking about somewhere else. So, a restaurant everyone thinks is good but nobody has been to, the lesser-known member of Reading’s high end club. How could I resist a visit? Actually, on arrival we spent more time in the opulent basement bar than I was expecting. Despite only two tables being seated in the whole restaurant we were asked to wait in the bar “for around ten minutes”, for reasons which weren’t made clear. We sat on the banquette, flicked through the wine list and ended up going for a Crozes Hermitages for £38. It was good, peppery and not too tannic – although given the dishes we eventually ordered, I rather wish we’d picked something more capable of standing up to them. We ended up staying there while we got the menus, read the menus, plea-bargained and made our choices, only taking our seats when they were close to serving our starters. I enjoyed that – I’m usually so wedded to the idea that you sit at the table, you give the waiter your order and you sit at the high-backed chair sipping your wine until the food arrives. It was nice to loaf, although I was still a bit incredulous that the waiting staff didn’t seat us right away. The dining room in Cerise is in two halves – a small room along from the bar and a bigger room further through (opening out onto that secret garden I mentioned). On a quiet Monday night, they’d only opened the smaller room which can’t seat more than twenty people. I liked it – tasteful, well-lit, good chairs and nice big tables – although if I’d been at that table on a busy Saturday night I might have felt like I was sitting in a corridor. As it was, it worked well, giving the feeling of being in a smaller, more intimate place. There was bread at the table when we sat down and it was nice if not wildly exciting – two slices of granary, one of something poppy-seeded and (the most interesting) a sweeter onion bread. The butter was at the right temperature to spread, a small thing but something a depressingly large number of restaurants get wrong. It’s a pet hate of mine when people say something is too beautiful to eat: nothing is too beautiful to eat, and if you really feel that way you should be in the Tate, not a restaurant. 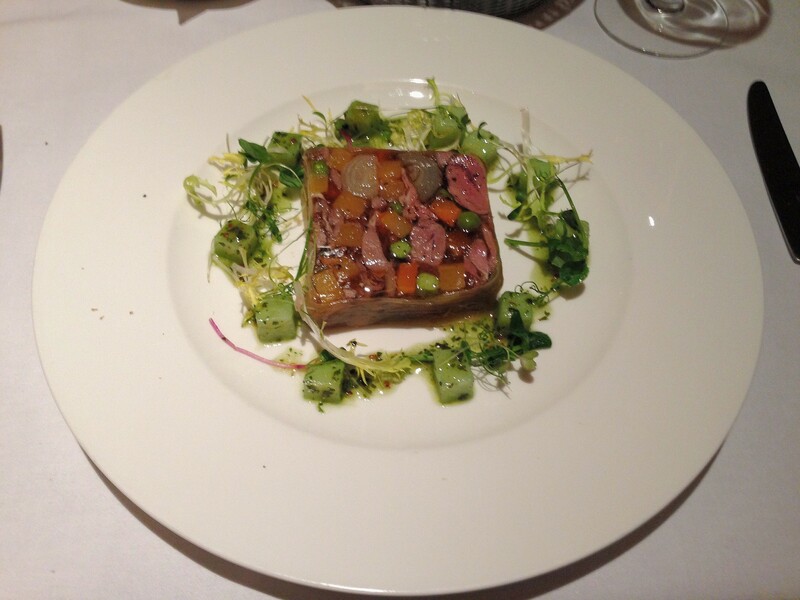 Having said that, the braised lamb shank terrine really was pretty – pieces of lamb, cubes of carrot, peas and big pieces of sweet leek, with another strip of leek around the outside. I did feel apprehensive about eating it, though, because I was expecting something coarser and all those chunks (such an unattractive word), bound together with jelly felt like a Damian Hirst starter at best and Pedigree Chum for poshos at worst. All those fears dissipated with the first mouthful. Really there was very little jelly in it, just tender tasty meat and firm, fresh vegetables. The mint dressing drizzled around the perimeter was sweet and perfect and what I’d mistaken for cucumber were in fact little cubes of green waxy potato. Potato, lamb, vegetables, mint sauce… it was only by the end that I realised that what I was eating was a high end distillation of the kind of Sunday lunch enjoyed across the country every weekend. I won’t say it was deconstructed – because that’s a word nobody should see in a restaurant review – but I will say that it was delicious, which is far more important anyway. The crab and salmon sausage was equally delicious (although, somehow, I found myself wishing they’d called it a “boudin”, because ‘salmon sausage’ just sounds plain wrong). Whatever you called it, it was delightful once you got your head round something with the texture of a sausage and the taste of fish. It came halved and resting on a little pile of cabbage which in turn was in a pool of dill sauce, peppered with tiny cubes of carrot. The sauce had a deep, salty flavour – so different from the sometimes insipid taste of dill paired with fish. On top was a little nest of salad shoots which didn’t really add anything to the dish (they never do, in my opinion) but looked pretty just the same. The mains were an altogether more robust affair. What was described as “roasted crown of partridge, Brussels sprout’s and saffron risotto” had a lot more going on than that – so much so, in fact, that it was almost possible to forgive the wayward apostrophe. So there was partridge – gamey, nicely cooked on the outside, if ever so slightly tough – and there was a gorgeous risotto, strands of saffron visible in it, with just enough bite in the rice. But there was also what looked like a potato croquette, and there were smoky lardons, and smudges of pea pureé and a generous and intense jus. I was really impressed by just how many things were on the plate, all done well, without it becoming incoherent or too busy. It was, however, a very rich dish, and I can easily imagine that it would defeat someone less gluttonous than me. The duck confit “with mixed bean and wild mushroom cassoulet, orange essence” was also not for the faint-hearted, another big bold dish. The duck itself was exactly as you’d expect duck confit to be (though personally I prefer the skin to be crispier). The cassoulet base was a beautiful jumble of beans, lardons and wild mushrooms in another gloriously savoury, expertly reduced jus, a wonderful wintry stew. As with the duck skin I would have preferred the lardons to be crispy and, as with the partridge, I did find the dish a little overwhelming towards the end. Amongst all those deep flavours the orange essence was lost to me; maybe it was overpowered, although it didn’t feel as if the dish missed it. The side dishes, with hindsight, were a mistake. Not because they were bad – the chips were good, with the right balance of crispiness and fluffiness and the honey roasted root vegetables were even better; sweet, slightly spiced with that slightly fuzzy stickiness that comes from cooking them properly. But they weren’t needed, and maybe the waitress should have pointed that out (in fairness, we were hungry and insistent and I’m not sure we would have taken no for an answer). Even so, service just wasn’t like that. I was surprised that it didn’t quite match up to the food – the waitress was polite and pleasant but her English didn’t seem brilliant and it didn’t feel like she knew her way round the menu. That side of the experience wasn’t as polished as you might expect, given everything the restaurant had got right. I was nearly too full for dessert, but in the end the prospect of brown bread parfait, with caramelised pears and peanut brittle was too tempting to resist. Again, that spare description didn’t quite do it justice: the parfait was in a cylinder, the outside studded with tiny nuggets of peanut brittle. The caramelised pear was terrific, served in an espresso cup with a buttery crumble topping. But the thick toffee sauce alongside the parfait was what made it special – rich, decadent, thoroughly wicked (much, I like to think, like most of the people checking into the hotel upstairs). Pricing at Cerise is remarkably consistent – most of the starters hover around the ten pound mark, most of the mains are twenty pounds and all the desserts are just under a tenner. The bill was £110 for two and a half courses each, two side dishes we really should have gone without and a bottle of very nice wine. I know that’s a lot, but I didn’t leave feeling cheated. Special occasion prices, then. But was the food special occasion quality? I think, on balance, the answer to that is yes. The room could be a little nicer, the service needs to be a little more impressive but the food makes up for much of that. The word that keeps jumping out of the review is “rich” and I think that does it justice. It’s properly indulgent, over the top, powerful food – not too clever, but just clever enough to feel slightly different – and for that kind of meal, I can’t think of anywhere in Reading that offers anything similar. I can see myself going again – more readily than I can see myself going back to London Street Brasserie or Forbury’s – but I can also see myself not eating much the lunchtime before and rushing home afterwards to undo the top button on my jeans. But everyone needs a meal like that from time to time. Don’t they? N.B. La Courbe appears to have closed in March 2016. I’ve left the review up for posterity. First things first, La Courbe is not a great restaurant: there are just too many things wrong, even now almost two months after they finally opened. The room is a simple square with one wall of glass which makes dining there akin to being in one of David Blaine’s failed stunts, a spectacle for everyone who passes through King’s Walk to see (about four tables were occupied the night I was there, but if it had just been me I would have felt terribly self-conscious). And the view through that wall of glass if you’re a diner, apart from any gawping passers-by, is the side of a Burger King, hardly the most beautiful vista Reading has to offer. Then there’s the decor, a peculiarly retro design of chrome, purple and pistachio that made me half expect Don Johnson to walk in with his linen suit sleeves rolled up. There are no soft furnishings, no art, nothing on the walls to distract the eye from the pistachio panelling. Everything is square – the tables (with, bizarrely, the exception of a single round table which is otherwise no different to the others), the chairs and every single plate or dish brought to our table throughout the meal. The menu is confusing, with nothing to indicate whether the mezze is a really bad deal (£42 per person for some mezze and a main? Really?) or a really good deal (£42 for some mezze and a main for four people! Bargain!). Add to that the fact that the room is chilly – the door left permanently open – and occasionally murky with smoke from the open kitchen (which is presumably why said door is never shut) and you’d be right in thinking that this isn’t the kind of restaurant in which you want to relax and take in the ambience. Oh, and did I mention how quick it all was? We were seated at around half eight, and with starters, mains and desserts we were out of the door at about quarter to ten. There seemed to be no understanding at all that an evening meal ought to take a reasonable part of the evening, and normally when I eat somewhere that serves you that fast it’s because they’re worried you might change your mind. It’s never a sign of confidence in the food. So far, so bad, but then something happened that switched this review around altogether: I ate the food. 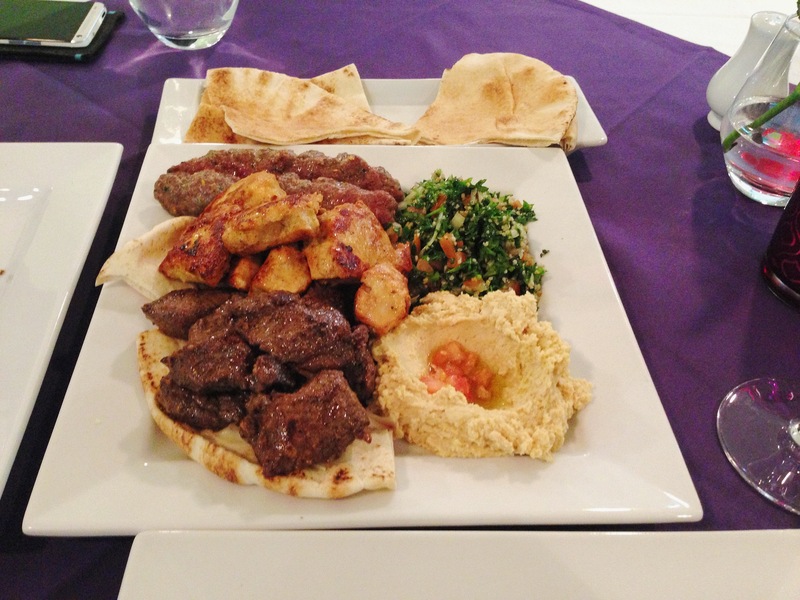 We started with two dishes from their hot mezze menu. 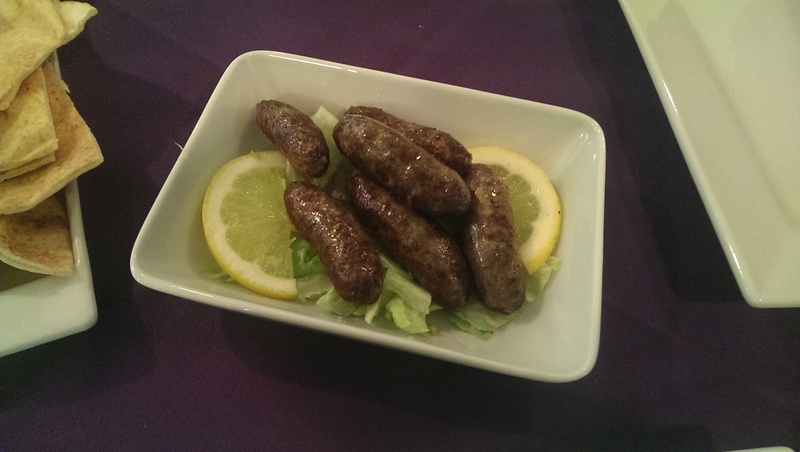 Maqaneq is a little dish of mini sausages “flambéed in butter and lemon”. What the menu doesn’t tell you is that this is a sophisticated version of the English cocktail sausage. These little sausages are juicy and meaty and lightly spiced so that the sweetness of the meat comes out. We ate them in tiny chunks (smiling smugly all the while) to eke them out and wrapped in slivers of pitta to make tiny sandwiches just so we didn’t finish them too quickly. The falafel were less of a surprise but still delicious – each hot little disc was crispy on the outside and fluffy inside and just herby enough to elevate them out of the ordinary. We waited for our plates to be cleared but then suddenly the waitress was back with our main course, to be eaten off the same plates with the same chunky cutlery as before – another mark against them. We had gone for the mixed grill (just like the typical Brit on foreign shores). This was described quite plainly as “charcoal grilled selection of lamb, Kafta and chicken with Hommos and Tabouleh” (I swear I find another way to spell houmous every month, maybe it’s like the Eskimos having all those words for snow). It looked terrific, and it tasted even better. The chicken, marinated with ginger and garlic, was just perfect – tender on the inside yet caramelised on the outside, sticky and delicious. The lamb was also spot on, just the tiniest bit of pink in the middle of each piece, and had a hint of cinnamon. The lamb kofte (my spelling) was the least interesting of the meats but third place was no disgrace in this selection. Rather than being the very spicy kofte that I’m more familiar with, this had a subtle, almost buttery flavour and was soft and delicate. The mixed grill came with two accompaniments. In one corner of the dish was some good (if unexciting) houmous with a pool of olive oil and some finely chopped tomatoes in the middle. In the other corner, just to offset all that meat, was an extremely good tabbouleh, singing with the fresh green flavours of parsley and mint, with plenty of lemon juice. It might even have been my favourite thing I ate that evening, and I don’t say that lightly. All in all, the mixed grill was a thing of wonder, square plates or no. We didn’t feel quite up to a full bottle of red (which is a pity, because there’s a good selection of Lebanese reds including Chateau Musar, which I’ve loved in the past) so we plumped for a glass each of the Domaine des Tourelles, a Lebanese red which was full and fruity and a good foil to the spicy meats. I didn’t really fancy dessert after that mammoth undertaking but there’s a sense of duty about doing ER reviews so we gamely went for it. 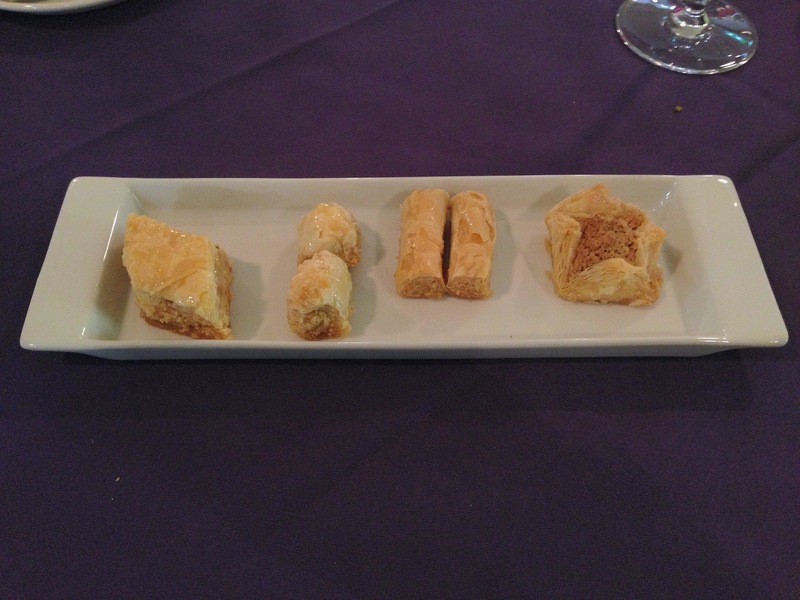 The baklava, rather than being one big baklava oozing with honey, was a selection of the familiar pastries in different shapes with either pistachio or pine nut fillings. I really liked them – they were much less cloying than they can often be, subtler and more interesting. The mouhallabieh was not as successful. The waitress described it as a chilled rice pudding with rosewater and pistachio – which captures it quite well, but neglects to mention that it had either been chilled for some time or it had been set with gelatine which meant that the nice gritty rice texture was replaced by something far less enjoyable. Between us we managed about half of it but after a while a dish that gloopy and big became a bit of a burden so we left it unfinished. 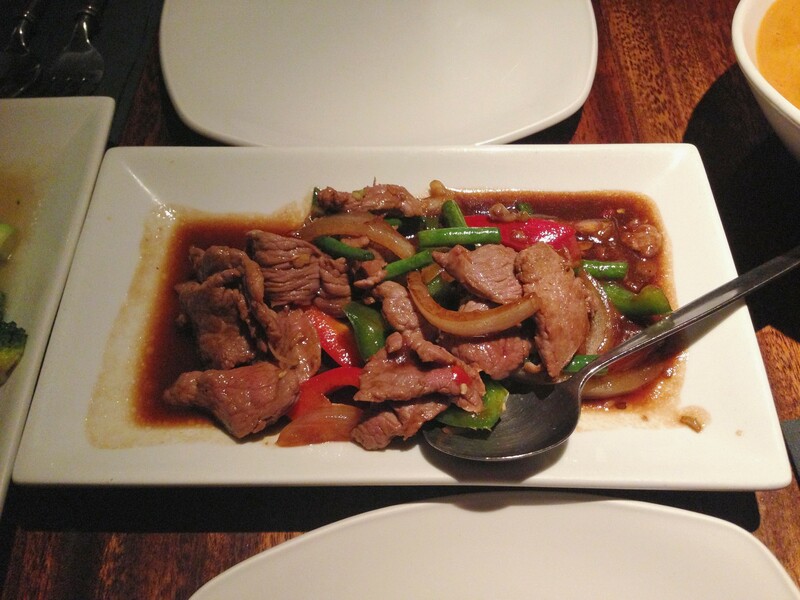 Service throughout was warm and friendly, enthusiastic about the food and more than willing to make recommendations. Even so, the whole set-up seemed a little, well, amateurish. The speed with which the food came was the most obvious problem, but there were others too: we weren’t offered water at any stage (despite there being water glasses on seemingly every table but ours) and the till is down the corridor in the adjoining wine bar, so you have a bit of a wait once you’ve asked for the bill. 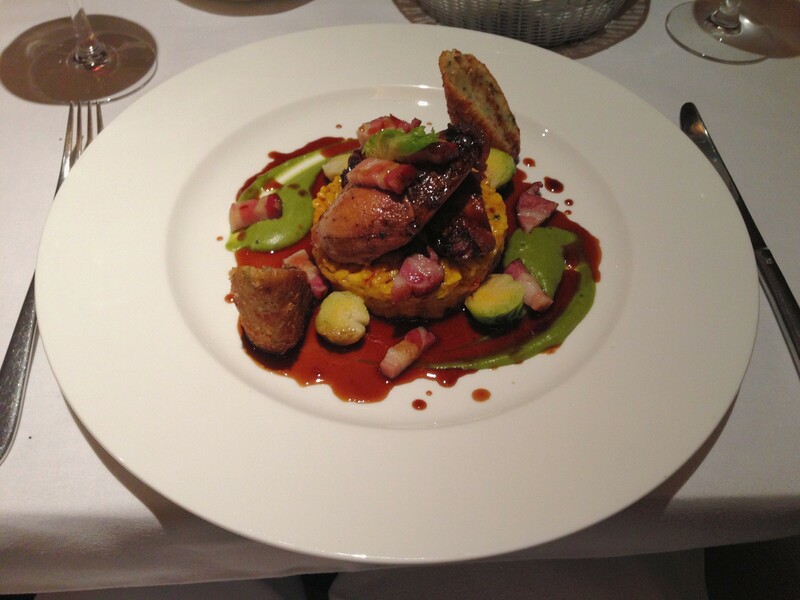 Ours, when it eventually arrived, was £57 for two people eating three courses and having a glass of wine each. I felt like this was a pretty good deal given how good the food was (the mixed grill for two is about twenty-four pounds, for instance). Even while I was eating there I was already planning a return visit with friends, albeit probably at lunchtime when a quick meal feels like less of a problem. Rating this restaurant has been nigh-on impossible, to the extent where I’ve wondered why I give ratings at all. How can I possibly give a single mark out of ten which reflects somewhere that serves such great food in such a problematic venue? I’m not sure my eventual score truly sums up the mixed message that is La Courbe; I wanted to give them higher but I just can’t until they get their crinkles ironed out. But I want them to do well enough to get the time to do that, because I can forgive a lot of things when the food is this good. Maybe this isn’t the venue for a romantic, lingering meal for two or a big night out, but I can see how one day it could be. And if that means I have to eat a few platefuls of their spiced chicken – in the cold, on those square plates, with that appalling view – to give them the chance to work on getting it right, then it’s a cross I’ll just have to bear. I ate out a lot in Reading long before I started Edible Reading. I remember when this town was a wasteland for diners, and all the places that have come and gone since those days. All the nacky chains when the Oracle first opened: Yellow River Café, Old Orleans, Ma Potter (did anyone ever actually go to Ma Potter?) I remember Bistro Je T’Aime, on Friar Street where Nando’s is now, a joint whose sole purpose seemed to be to put people off French food forever. Lots of restaurants have closed as Reading has slowly, gradually improved on the culinary front – the most recent, Kyklos, only last month. And yet throughout all that time Thai Corner has been quietly, unobtrusively plying its trade on the corner of Friar Street and West Street, at an end of town which was unfashionable ten years ago and is even more unfashionable now. It feels like Thai Corner has always been there, and back in the day I used to go there an awful lot. It was my go-to place when I wanted something tasty and affordable, because even at the turn of the century I liked to avoid chain restaurants where possible. But I haven’t been there in ages, to the extent where I wouldn’t have been surprised to walk past to find that it was the latest casualty in the constant battle restaurants face to stay afloat. I’ve always taken for granted that it would be around when I next wanted to visit, and if I’m honest I was slightly reluctant to review it in case it had a bad night (because I can’t remember ever having had a bad meal at Thai Corner). Nonetheless I put my nagging worries to one side and headed over on a rainy evening (has there been any other sort, this year?) to visit it “on duty”. The interior of the restaurant is a great illustration of how to use a compact space really well. They manage to pack a lot of tables in without you ever feeling like you’re on someone else’s lap or subjected to their small talk – mainly by breaking up the room with pillars and partitions. It’s also a very attractive room: all red silk and black framed lights, golden bells, wooden shutters and lighting which manages to be tasteful and flattering while still giving you a fighting chance of seeing what you’re eating. Handsome, comfy furniture, too. I’m sorry to come over all Living Etc., but I was really surprised by what a nice room it was to eat in; they’ve clearly invested in doing it up, and it shows. First things first: the Thai red wine (Monsoon Valley, a snip at about sixteen quid a bottle) is really tasty, light and fruity. I could see some other quite tempting things on the list (I think I saw Chateau Cissac on there for less than £30, for instance), but a good bottle of easy drinking red at that price was just too good to pass up. We ordered some prawn crackers to keep us going during the decision-making process and those were good too – the proper, thin, fishy Thai sort rather than the fluffy white Chinese ones that are always slightly reminiscent of polystyrene packing chips. 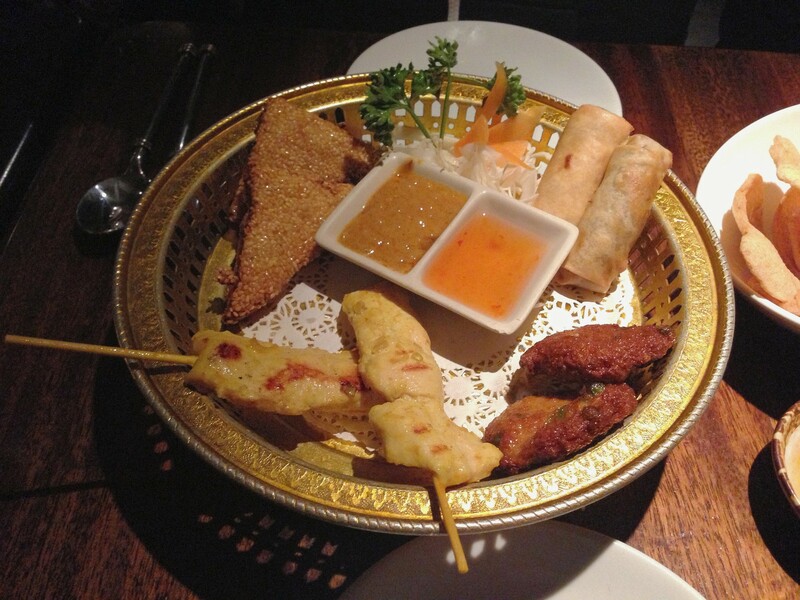 I’ve clearly learned nothing from my last trip to a Thai restaurant, The Warwick, because again we started with the mixed starters, which were served on a handsome traditional-looking golden platter (I’m not sure if the accompanying paper doily was quite so traditional, but never mind). I know it’s a bit of a cliché but it’s a useful way to assess lots of dishes at once. As assessments go, Thai Corner’s selection weren’t particularly inspiring. The spring roll was bland and the pastry was too thick and heavy; it was improved by dipping it in sweet chilli sauce, but then again what isn’t? The chicken satay was only just hot and only just cooked, with no real texture on the outside and no real flavour. Again, the satay sauce wasn’t bad but there wasn’t a lot of it and it didn’t redeem matters. The fish cakes were better – they’re not usually my cup of tea because I’ve always found the spongey-bouncy texture a little off-putting but these tasted good, with hints of lemongrass and spring onion. The pick of the bunch was the sesame prawn toast: what’s not to like, really, about a triangle of fried bread (a mainstay of the English breakfast) topped with minced prawns and a crispy layer of sesame seeds? It’s one of those dishes people eat all the time at Chinese and Thai restaurants without really thinking about it but when done well it’s a genuine delight. Thai Corner’s prawn toasts were exactly that – the layer of prawn not too thick, tender and meaty rather than pink and springy. With hindsight I should have just ordered lots of those and forgotten all the other starters but that’s hindsight for you, always taunting you with the perfect meals you didn’t have. The mains, fortunately, were better – although still a long way from perfect. The prawn Gang Ped (red curry with bamboo shoots and aubergine) was pleasant enough but not very interesting. The prawns were firm and well cooked, the vegetables were all tasty and not soggy, but the sauce let it down. There was no heat there, no real sign of fish sauce and no complexity in the flavour, so all you really got was the sweetness. Poured onto the coconut rice towards the end it was delicious, but almost more like a dessert than a main. The chilli lamb, on the other hand, was fantastic: a generous helping of thin slices of tender lamb in a delicious sauce which had everything the red curry sauce had been missing – heat from the chilli, zing from the lemongrass and a little bit of oomph from the garlic. The green beans in it had just enough crunch, too, to add the contrast the dish needed. It was by far the best thing I ate all night. On the side we had a couple of bowls of that coconut rice plus a serving of pad broccoli. I’m afraid I insisted on this as I remember the dish being simple steamed broccoli served in a thin, almost fragrant oyster sauce which lifted the broccoli just brilliantly. However, my memory must be a bit out of date as the sauce with this broccoli was pale, watery and insipid and didn’t have anything going for it. This dish – less than half a floret and some underwhelming sauce – felt like a bit of an insult at £5.50 (I suppose when you have fish sauce in a lot of the dishes maybe you’ve given vegetarians up as a lost cause). Service at Thai Corner merits a mention because it gets the balance just right – friendly, helpful, there when you need them and (I’m not sure how they manage this) almost invisible when you don’t. It’s always been that way in my experience but it’s also particularly noteworthy because, on a Wednesday night, the place was almost completely full: it seems my worries that Thai Corner might be closed next time I wandered past were completely unfounded. This is a restaurant that has a lot of experience at managing a full house, and it shows. Looking at the staff serving the other tables they were efficient without being bustling, and busy without ever seeming out of control. The total bill for two people – starters, mains, rice, a bottle of wine and that slightly tragic broccoli – came to just under sixty pounds, not including a tip. On this occasion we decided to forego dessert as we were just too full – although the Thai Corner desserts have never appealed to me, being a bunch of frozen offerings that are unlikely to have been made on the premises. It’s almost worth ordering the “Funky Pie”, though, just so you can sing your order to the tune of the 1980 Lipps Inc classic “Funky Town” in a busy restaurant (you can have that tip for free, and apologies in advance if those efficient, quiet, polite serving staff throw you out). I know comparisons are odious, but it’s impossible to review Thai Corner without comparing it to The Warwick, its closest competitor in Reading. Thai Corner wins on many levels – it’s a lovely room, it’s a great use of space, the buzziness makes it a fun place to eat, the service is impossible to fault and the wine list is attractive. And if that’s all restaurants were about, Thai Corner would get as good a mark as there is. But, as so often, it comes down to the food and Thai Corner’s just isn’t quite as good as its rival all the way at the other end of town. The satay is a little too limp, the spring roll a little too heavy, the curry a little too bland. I liked Thai Corner – just like I always have – and it didn’t let me down, even if it didn’t quite blow me away either. Still, I know they won’t mind: more than ten years on, without any fuss or fanfare, they are still one of the best places to go in Reading for an unspecial occasion. They don’t need my custom, which is wonderful to see, and I admire them for doing what they do so well. And, if I’m being honest, a big part of me would be disappointed if they weren’t still around in another ten years. It seems like 2014 only just kicked off and here we are, busier than ever. Hopefully you all made it through to the end of the month with your resolutions intact (if you made any) and with your January pay packet not completely spent before you earned it. Clichés aside, January and February can be some of the leanest months for the fun stuff with the dark and rainy weather making everyone want to stay in – especially when the alternative is going out and paying extortionate amounts of money for a Valentine’s meal where romance is the one dish that is never reliably on the menu. Despite harvest time being a long way away there’s been a bumper crop at Edible Reading. I’m really pleased to say traffic on the blog surprises me (in a good way) every month and I owe that to you lot, so thank you. Oh, and don’t be put off by this being a round-up – there’s lots happening in the Reading food scene that simply isn’t covered by the reviews. But let’s do the reviews first – here’s what you may have missed. Barts, 6.2 – What a start to the New Year! Of course, you could read reviews in the local papers (where it gets covered at least every 6 months – why could this be?) but if you really want to know what its odd mixture of good service and mistake-laden food is like, check out the full ER review here. Sweeney and Todd, 5.2 – The legendary pie shop has been drawing in the punters for over 30 years. Why? Search me. Bad boiled potatoes and “hot jelly” got the lowest mark from ER this month. See why here. Bhel Puri House, 6.8 – Reading’s only vegetarian restaurant is easy to miss but worth seeking out for the chilli paneer alone. Click on the link here for the full lowdown on an excellent alternative to Reading’s sometimes monotonous lunch scene. The Bull on Bell Street, 5.3 – This is what happens when a revamped boozer doesn’t have a kitchen to match its good looks. Such a shame. Have a drink but my advice is to give the food a miss. Go here for the full sorry story. In other news (cue the shuffling of papers while I wait for the autocue to get to the cute hedgehog story at the end of the broadcast) there has been a flurry of new places opening or getting ready to open. First of all, three months after I first mentioned it and a full four months after its promised opening date, Lebanese restaurant La Courbe has finally opened in King’s Walk, along with its adjoining wine and cocktail bar (on the side nearest The Mix, so perhaps they’ll get some overflow trade). First impressions, from a walk past, are mixed at best. The décor – lots of purple and pistachio, chrome, cream leather and square glass tables – is rather stuck in the 90s, and the restaurant space is basically a glass-fronted box with an open kitchen at the back. On the other hand, I’ve heard decent reports of the food. It will be nice to see if someone can finally make a go of one of those downstairs units in King’s Walk – I’ll be there to review it in due course. The other new place due to open is My Kitchen, in a skinny little unit on Queen Victoria Street. Again, the interior looks very now, all bare brick and funky chalkboards, and I’d guess it will be a lunch place but that’s all I can say. They have no website that I managed to track down: honestly, you try Googling “my kitchen Reading” and see if you have any more joy than I did (the curse of the town name that also happens to be a verb strikes again). The picture below is pretty much all we have to go on, but I’ll keep peering through the windows and will report back. 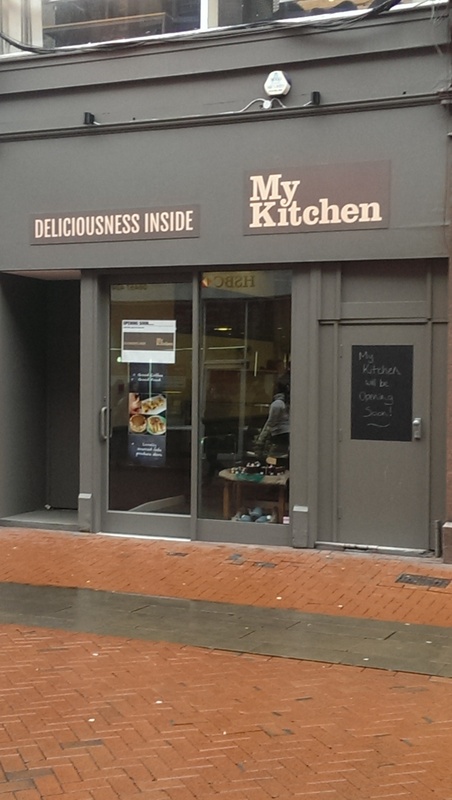 Of course, the flipside of new restaurants opening is existing restaurants closing, and sadly Kyklos, the Greek restaurant in King’s Walk, has closed this month. They didn’t quite make it to their first birthday, which is a real shame – when I reviewed it in October I thought the service was amazing but the food was patchy, and I was worried then that it was a large room which was never even remotely full. I’ve added a note to the review which is here. Another piece of restaurant news relates to a change of personnel. Since the ER review of Forbury’s in November, chef Tom Kneale has announced on Twitter that he has left by mutual consent with immediate effect, to relocate to Bristol and spend more time with his family. Hopefully he will manage to find a new role where more of his creative ideas make it out of the kitchen in front of the diners. Normally I wouldn’t announce this – ER is much more interested in food than in chefs – but it does seem relevant in this case. I’ve also added a note to this review, too, which is here. Talking of being creative, it seems that ER is having quite an influence on the local papers, despite just being a little blog. After almost six months of ER visiting, reviewing and recommending the best independent restaurants the Reading Post has crowdsourced a similar list using Twitter and published it with useful pithy remarks such as “upmarket Indian” and “suburban Thai”. Still, better late than never and it’s nice to see them supporting small local businesses. In unconnected news, the same week the Post reviewed Cleavers in Wokingham, an offshoot of large Italian chain Prezzo (this time hoping to be “the place for burgers, chicken and ribs” – as opposed, presumably, to all the other places). Still, there is one local business that can always rely on support – the Post also published a piece recently publicising a wine and canapés evening at Bart’s. They just can’t stay away! Right, I can see the hedgehog story approaching on the autocue so that’s definitely the end of this month’s round-up. Keep telling me – by email, by commenting, or on Twitter – where you want to see reviewed and I’ll add your suggestion to the list, which is here. In the meantime, tune in next Friday when there will be a new, unbiased, independent restaurant review for you. Just like always.